On to the lifting mechanism that will set the cut height of the blade. I decided to use an acme rod for this since in theory it should be easier to automate in the future. I also like that it provides rigidity in the up and downward directions. 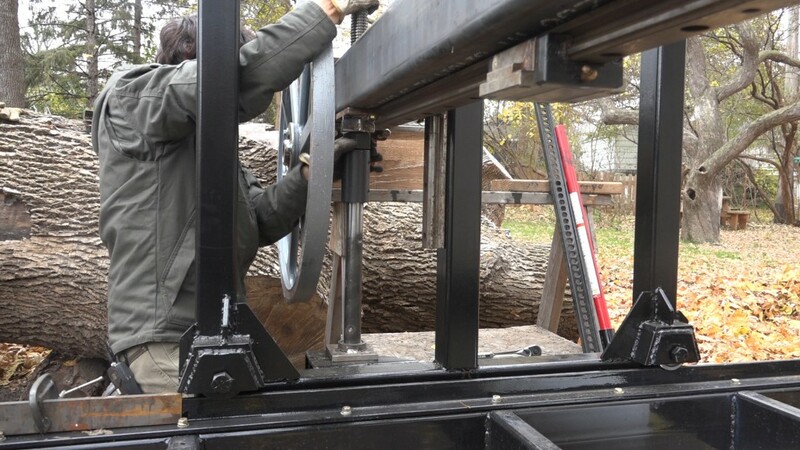 With a cable or chain lift, the weight of the saw head is used to keep the head stable. I’m not sure how great of a possibility it is but with the saw head just hanging there, it could bounce while cutting. 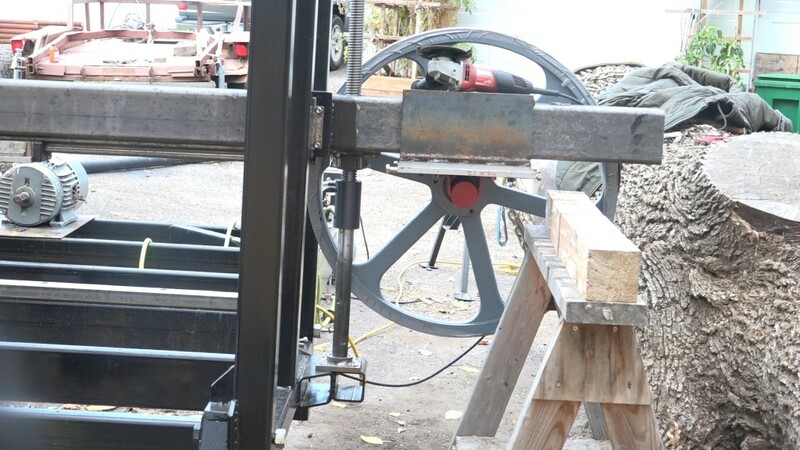 At the bottom of the carriage, I added these extension platforms which the lifting assembly will rest upon. 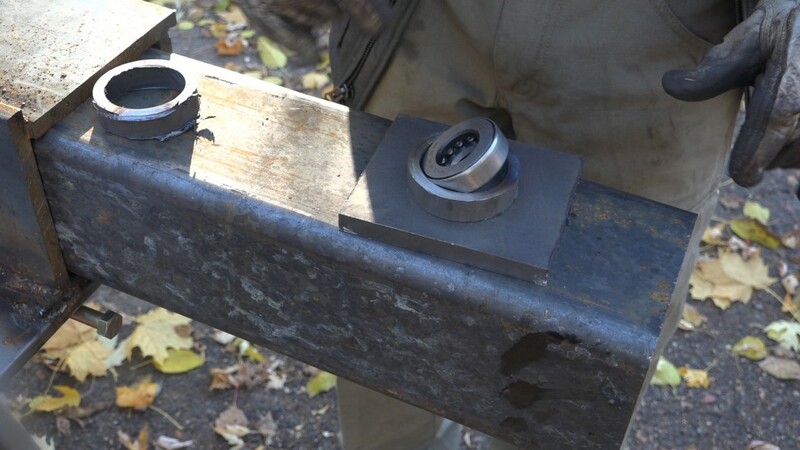 At the very bottom of the assembly will be a thrust bearing that will carry the weight of the saw head. I need to make a mount and holder for the bearing so I picked up a section of DOM tube with an ID that the bearing will fit into. I’ll cut a ring out of the tube that is just slightly shorter than the bearing is tall. 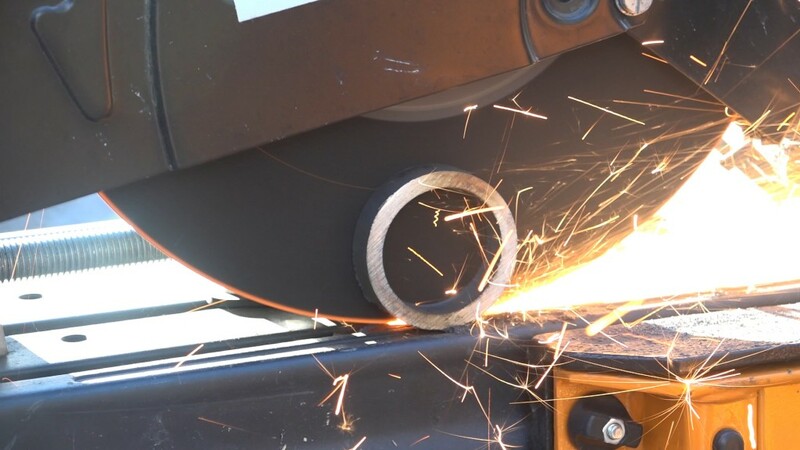 That ring will be welded to a mounting plate that will receive mounting holes so the assembly can be bolted to the carriage. 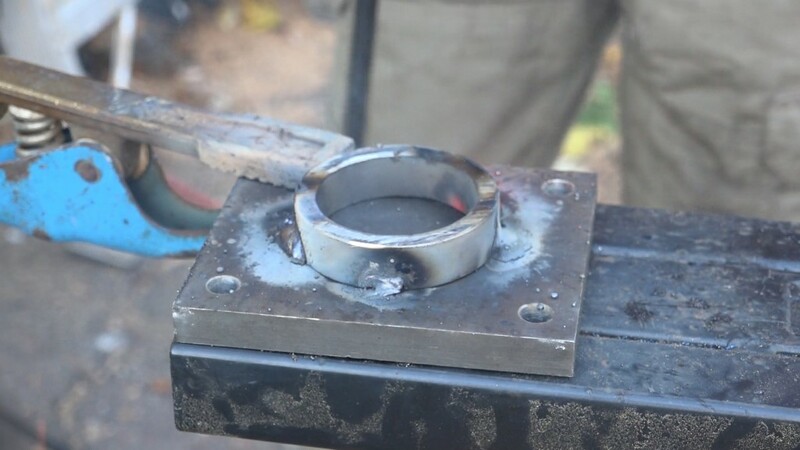 Here’s what the bearing holder looks like while being welded. Next I need to make extensions for the acme rods. An easier way to do this would be to get a rod that ran all the way from the top to the bottom. That would be close to 8′ in my case which would be a pretty spendy component. I chose to make extensions out of some DOM tubing and a coupler. 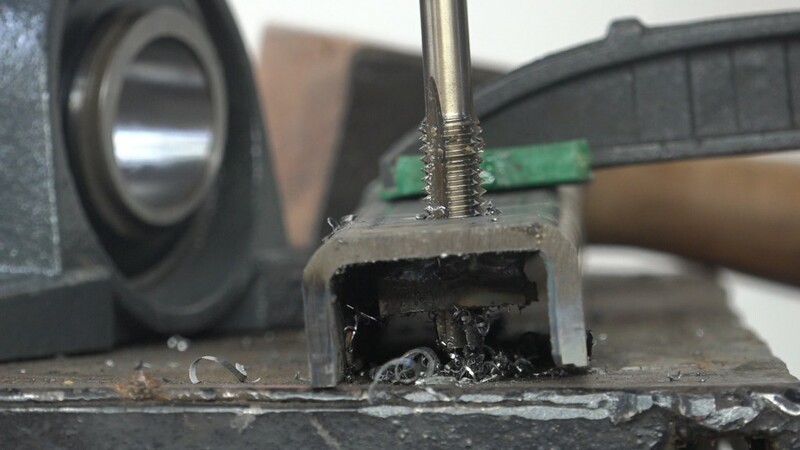 A piece of round stock fits into the DOM tube and the round stock will go into the bearing leaving the DOM to ride on the bearing. I cut two pieces of DOM to around 14″ and cut a few pieces of 1″ round stock. I didn’t have quite enough round stock so part of these extensions will be hollow which isn’t a problem since the load is transferred by the DOM tube. The round stock will be plug welded to the DOM tube so I drilled holes for the welds. I drilled 4 holes in each piece of DOM all the way through so there will be 8 plugs on each. The DOM’s OD is just slightly too big to fit into the coupler I’ll be using to join it to the acme rod. I mounted the DOM tube into my wood lathe and used a file and sandpaper to bring the OD down until it fit nicely into the coupler. Now I can weld them together. 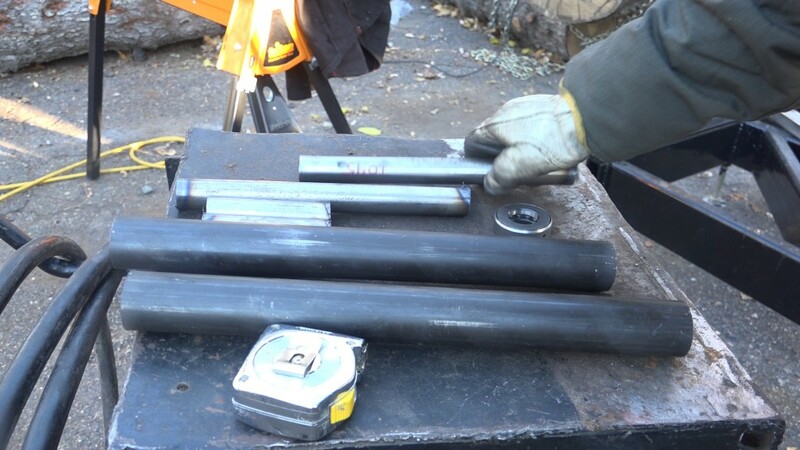 I set the protrusion of the round stock so that it would pass almost all the way through the bearing. I wanted to make sure that the shaft didn’t bottom out. Next the extension needs a keyway cut where it will go into the coupler. 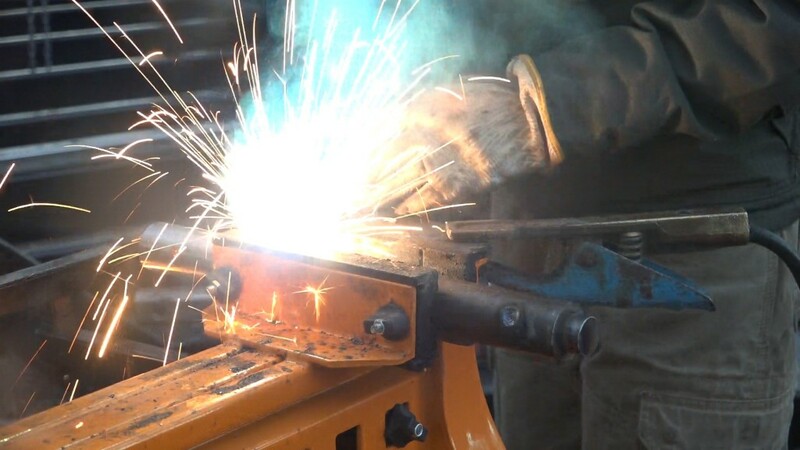 I used an angle grinder with a combination of a cut off wheel and a grinding wheel. 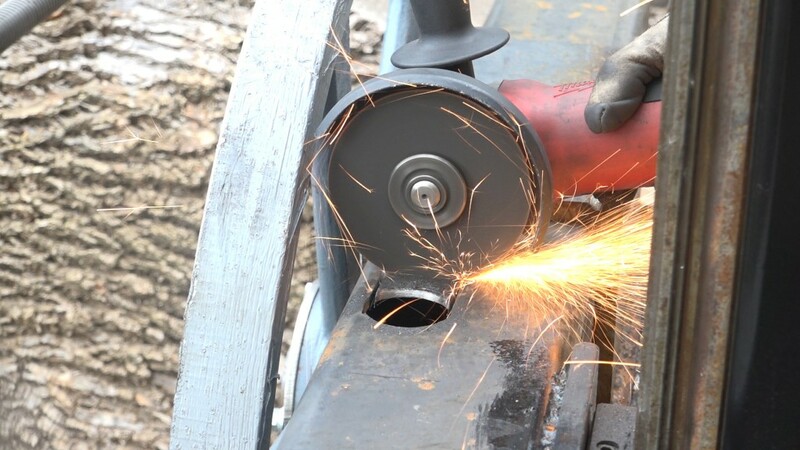 I used the cut off wheel to establish the extents of the keyway and used the grinding wheel to hog out the waste. I worked slowly and test fit the key stock as I went. The extension can now be set into the bearing and I can get the acme rod installed. 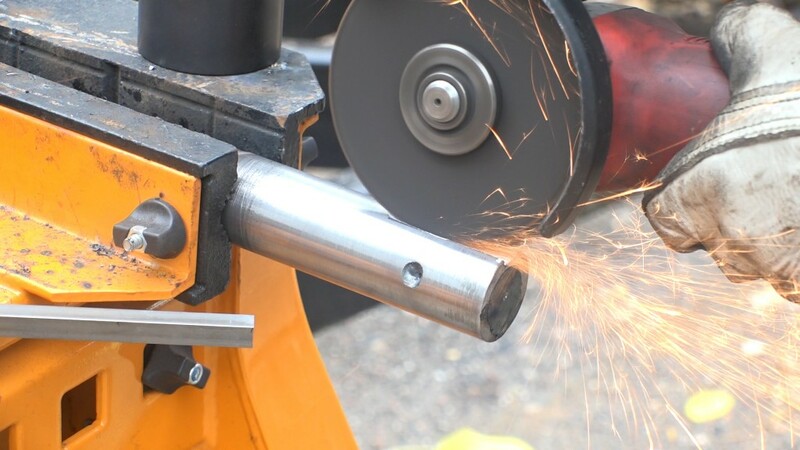 The rod passes through the clearance holes in the beam, through the nut holder, through the acme nut, and into the coupler. I didn’t do the best job keeping the holes aligned but since they’re just clearance holes, I cut away some extra material on the top side. Here is the lower assembly installed. 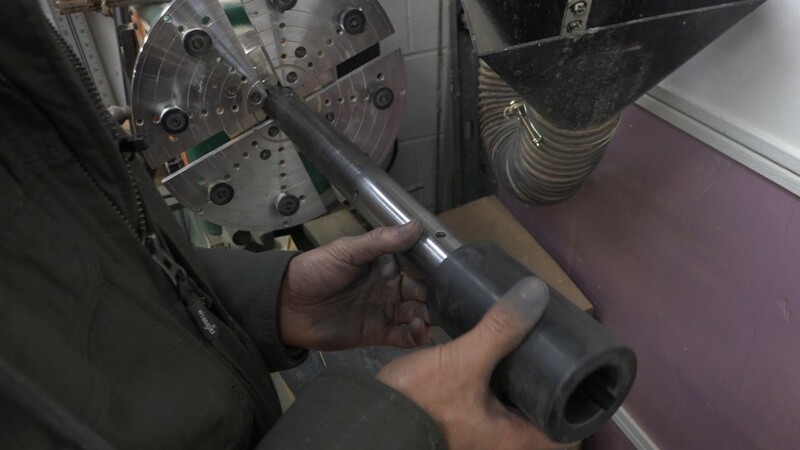 The top section is another coupler and a length of 1.5″ shaft stock. 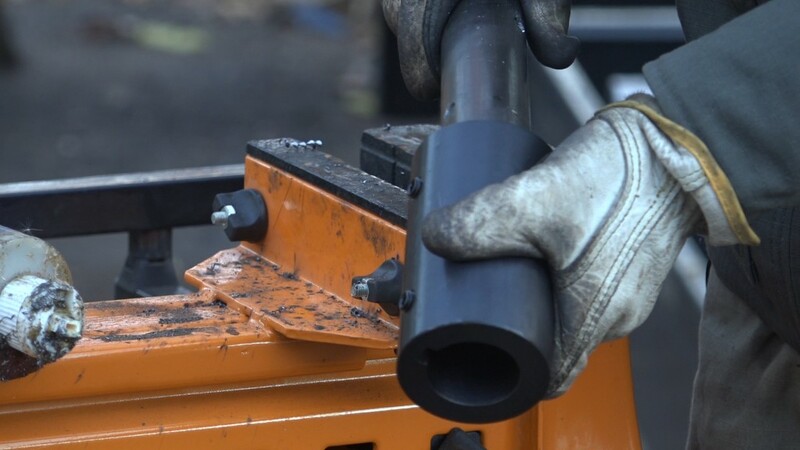 The shaft will run through a pillow block at the top of the carriage and will hold the sprockets for the mechanism which will turn the screw. I cut the shaft longer than the height of the carriage just in case I need to mount something on the top side. 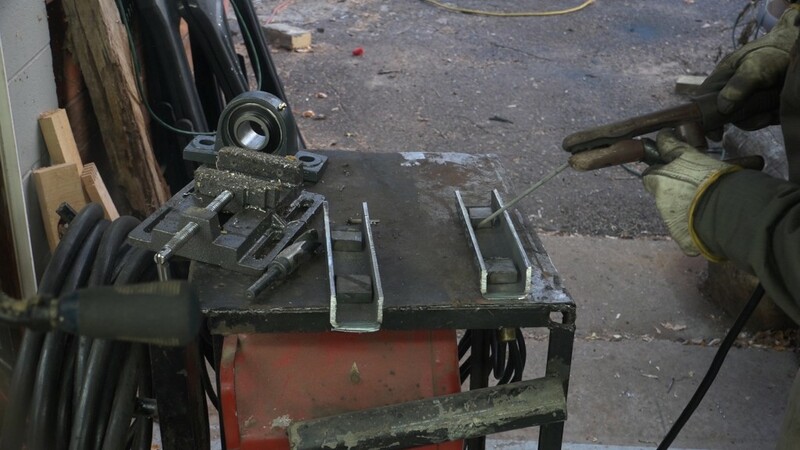 The bearing needs to be spaced out from the side of the carriage, so I cut a scrap piece of tube to the correct width and welded some blocks inside of it. These blocks will be where the mounting holes for the bearing will go. The extra material will give me more threads. I tapped these mounts for 1/2″ bolts. 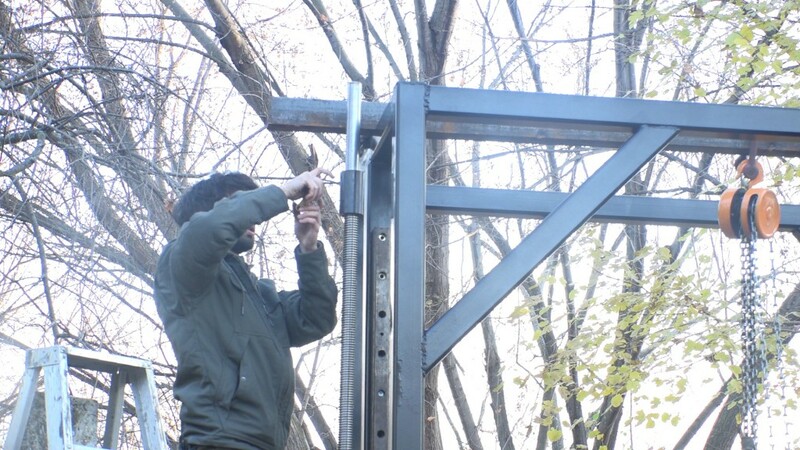 The mounts can be welded to the top of the carriage. 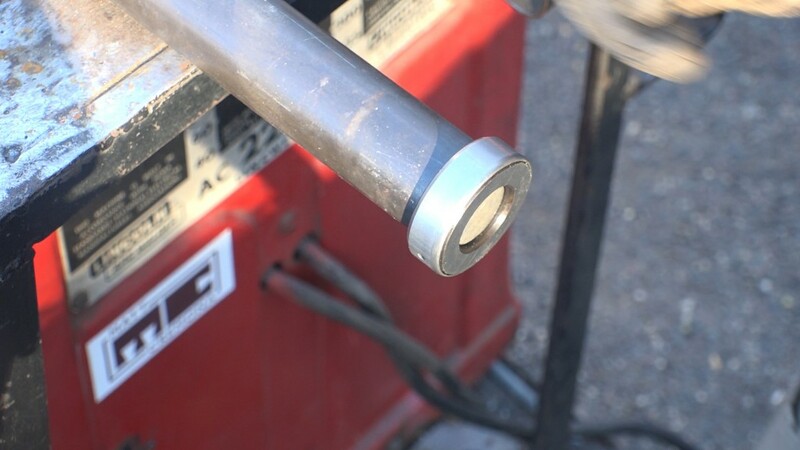 I slipped a piece of tube over the shaft to protect it from any weld splatter. 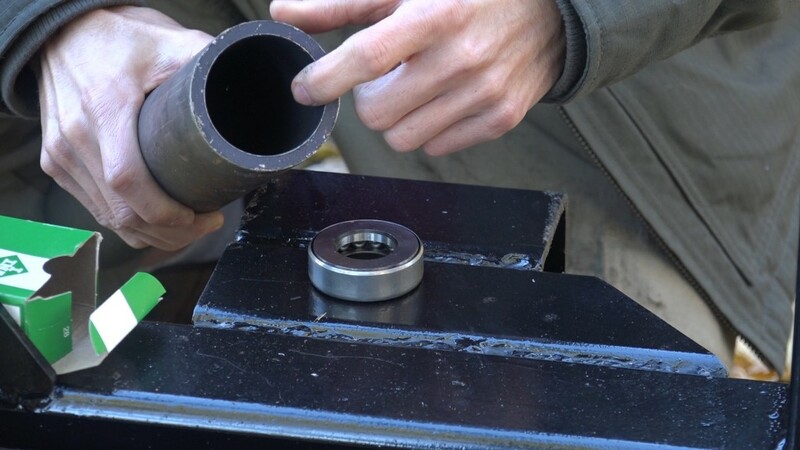 a close up of the mounting bracket that holds the Nut that actually lifts the Head when the Threaded rod turns. 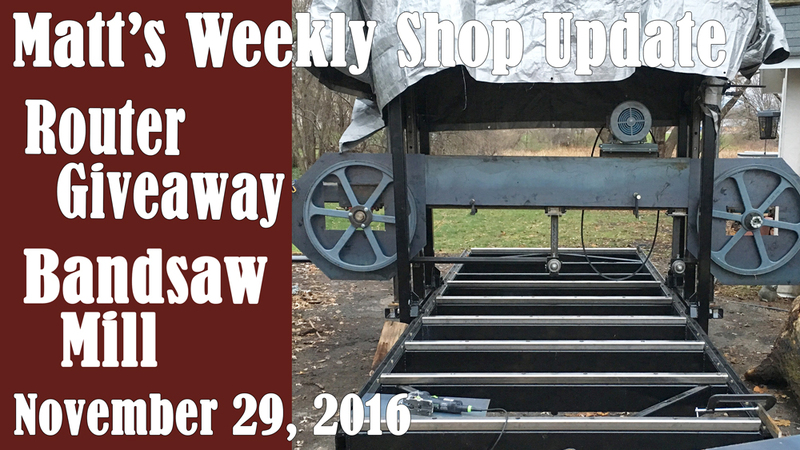 When do you expect to the video on motorizing the saw head? 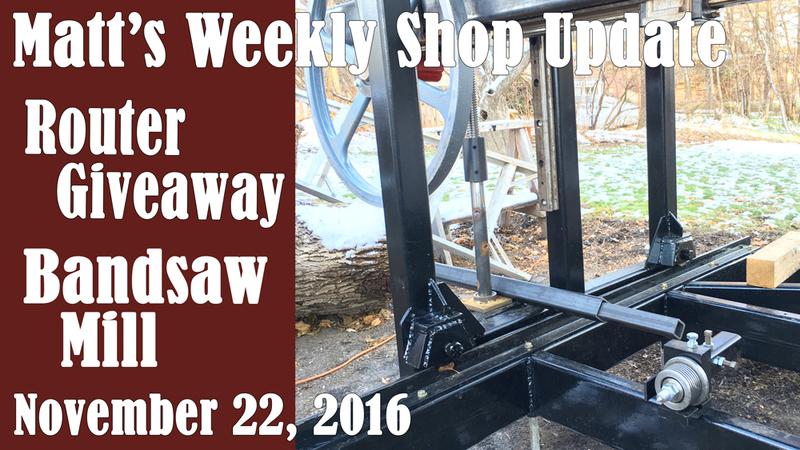 I’m designing my own mill now and I’m looking at a few options to move my saw head up and down. Really love your videos. I got the stainless tube from Discount Steel, a steel yard in town here. Thanks!! 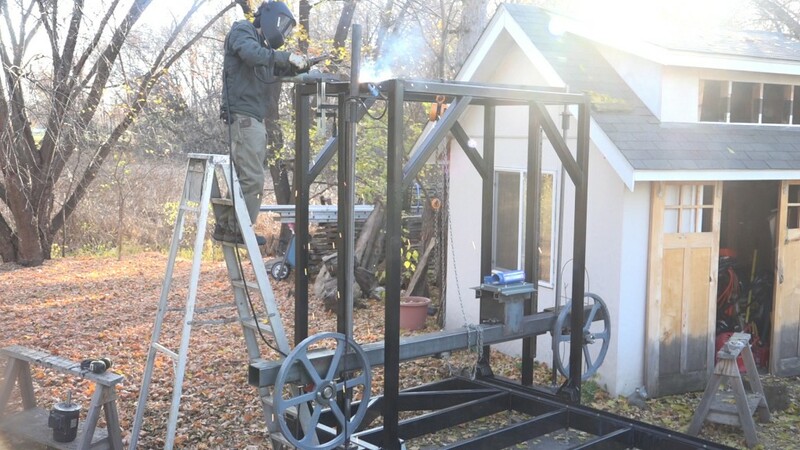 and not the same mill is $28 K so I am building one and I have enjoyed your videos. or closer I suppose.. and aliging the two sides for level and connecting the Chains and splrockets. Thank you! I’m using 6011 rods. What details do you want to see? Each side is leveled independently before the chain is installed to link them. I such as the precious facts you furnish in your own articles.I will bookmark your website and verify once again the following frty.enelquI am really totally sure I’ll learn loads of recent things precise here! Great luck with the upcoming! Excellent progress, even in the frigid weather. Keep up the great work to date. 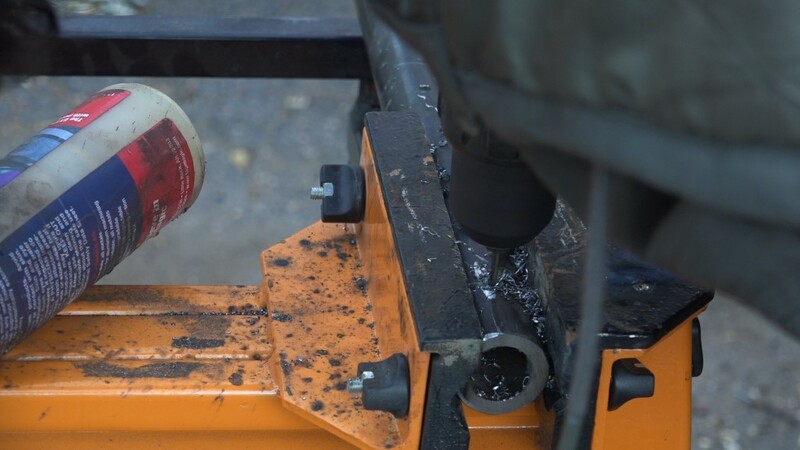 What brand and model of abrasive chop saw are you using?